Hence, I thought it high time to take a crack at this once again, although I’m not really going too far out on a limb, and probably should leave it to our Junior Open Wheel Talent (JOWT) spotter Ryan instead, right? Thus here goes nothing, (In a story that’s quickly morphing into another monster) as these are my picks for drivers of tomorrow to watch out for today - while I’m most enamored by the relatively unknown Tristan Nunez, who I’d ‘LUV to see get snapped up by the powers-to-be in IndyCar, i.e. ; Penske, Ganassi, Andretti, or upcoming Playuhs’ like Sam Schmidt or Sarah Fisher Hartman Racing! Its hard to believe that I ‘learn-ED ‘bout this aspiring Sports Car driver just shy of one year now, as Mary Ellen read a nice story to Mwah about him in a tiny “Fish wrap” newspaper in Eugene, Oregon as we awaited the arrival of ‘“Panda” from Burning Man at the Train Station. As the Floridian teenager was then knocking upon the door of winning the 2012 Prototype Lights championship, which he subsequently took on the back of eleven wins in his rookie season! Nunez then was named a Team USA scholarship recipient and capped off his season by taking victory in the prestigious Walter Hayes Trophy race - besting the likes of Peter Dempsey, (presumably the same Dempsey who just won the Indy Lights Freedom 100 in the Speedway’s closest ever finish - a four-wide photo finish by 0.0026-seconds! Not to mention also being a three time Walter Hayes Trophy winner) while Tristan has now turned “Pro” at the tender age of 17 and is contesting the Grand Am’s GX category as a Mazda “Works” driver along with contesting the ALMS’s Prototype Lights Challenge class, as Y’all can read all about I-T in his very thorough About section by clicking here. Obviously I’m not the only one who thinks he’s got some talent, eh? As the 2012 US F2000 champion was promptly snapped up by Andretti Autosport for its assult on the 2013 Pro Mazda Series, while I believe he was also a Team USA Scholarship recipient a la Tristan Nunez and has continued his winning ways in this season’s Pro Mazda campaign. Hey, yuhs gotta root for the O-L-D guy right? As Yano’s a relatively late bloomer at the age of 34 who’s chasing his dreams of making it to 16th & Georgetown one day as a driver by cutting his teeth as a rookie in this year’s Pro Mazda Series. Y’all can check him out by clicking here. Know very little about this driver other than it was entertaining hearing NBCSN’s ‘Wee Willie Buxom, aka Will Buxton ask Lotus F1 Simulator Jockey Jerome d'Ambrosio is it Frihns or “Freens” to which Jerome said it’s the same person; Hooah! Yet this aspiring ‘Neederlander has vaulted up the Open Wheel Racing “Feeder” ranks quickly, having won the Eurocup Renault 2.0 title on his first crack in 2011 before barging his way into the 2012 World Series by Renault title amid controversy upon ‘Turfing off title rival Jules Bianchi during the final race! I really like this Argentinean’s machismo, who sometimes isn’t “Politically Correct” but can definitely hustle a car and drive the proverbial wheels off of it! As Estaban was one of eventual Indy Lights champion Tristan Vautier’s fiercest rivals - and hopefully will be back once again as I was hoping he’d become Sam Schmidt’s lead gun for the Indy Lights title this year, but apparently fell afoul of that ominous lack of funding thingy that’s been sweeping the Paddock’s now for several seasons, as Esteban has fallen afoul of this multiple times, including lack of funding for a KV Racing Technology seat in Indy Cars and F1 with Manor Motorsports which became the Virgin F1 Team and then rebranded as Marussia F1. And while I have NO idea where he’s gone off to? It’s a shame he’s not racing Stateside after having finished runner-up in Indy Lights the past two years respectively behind Sam Schmidt Motorsports stable mates Joseph Newgarden and Tristan Vautier (by a scant 8pts) who’ve both gone onto IndyCar careers! This young Portuguese rising star first made a name for himself by winning the 2009 Renault 2.0 NEC Cup before garnering further attention by winning the prestigious Macau street race last year, along with notching up an impressive four wins during his debutant World Series by Renault campaign - now contesting the full season with the newly formed Arden-Caterham team. as a Red Bull Junior driver, da Costa along with Frihns both took turns behind the wheel of the dominant Red Bull chassis at last year’s Young Drivers test in Abu Dhabi and I’m guessing that he and Frihns potentially could be battling over one of Scuderia Toro Rosso’s seats for the 2014 season? 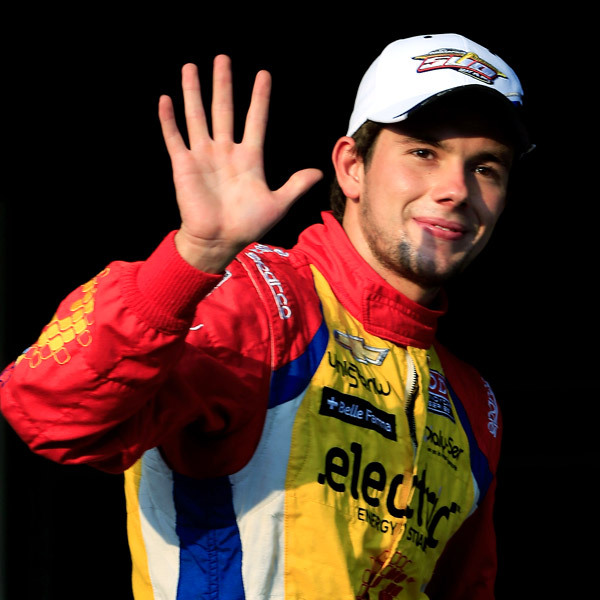 This soft spoken and very humble Columbian vaulted to the mainstream’s attention after his stirring debut at Mother Speedway, where not only did he out qualify his four other Andretti Autosport teammates, i.e. ; reigning IndyCar champion Ryan Hunter-Reay, Marco Andretti, James Hinchcliffe and E.J. Viso, but also finished ahead of A-L-L of them en route to Rookie Of the Year honours with an outstanding runner-up finish to Tony Kanaan. Although Munoz didn’t look very happy after the Freedom 100, where he’d started from Pole and led the majority of the race before getting picked off by those closely trailing him en route to the closest finish ever at Indianapolis! Its funny thinking that his current “Day Job” is in the Indy Lights and surely he’s now gotta be odds on favourite to win the title this year?